Toshiba has announced its latest range of laptops at CES 2011 in Las Vegas this week, featuring the latest Intel processors and USB 3.0 and Bluetooth 3.0 connectivity. 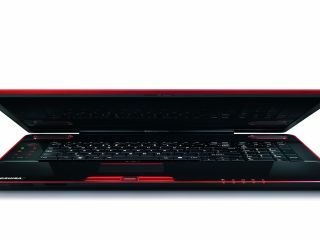 Also, for the committed PC gamer or power user, the new Qosmio X500 gaming laptop features additional 3D support, to let you get the best out of those games designed to make use of Nvidia's 3D Vision technology. Toshiba UK has also unveiled the Satellite A665 and Satellite A660 laptops in addition to the gamer-friendly Qosmio X500. The latest Satellite machines promise enhanced multimedia and connectivity features, with all three new machines powered by brand new second generation Intel Core i7 processors. Tosh promises consumers that all three new laptops "enable users to effortlessly create and experience content such as high definition video and 3D content, as well as run power-hungry applications including photo and video editing software with even greater ease." New Bluetooth 3.0 tech will also let you wirelessly transfer data with you mobile and other Bluetooth devices at 24Mbits per second under the right conditions. Finally, if its 3D movies or games you're after, then the new Qosmio X500's HDMI port will let you play them on your shiny new 3D-capable TV in the lounge. All three new Toshiba laptops, the Satellite A660, Satellite A665 and Qosmio X500, will be available later this month. Pricing is still to be confirmed.